In fulfilling its mission of aggregating products and services that reduce energy expenses for its customers, Mukherji Energy Management Associates considers using state-of-the-art, energy-efficient LEDs a no-brainer. So, the Southern California consulting firm was not surprised with the energy cost savings it observed at a small-scale beta site in a large homeowners’ maintenance corporation—population 24,000—located in South Orange County, California. After the installation of solid-state landscaping and pool lights, and management of lamp burn time, the monthly monitoring of the electricity bill showed considerable cost reduction. 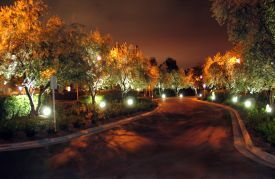 For its latest landscape-lighting project at one of the largest master-planned communities in the same coastal area, Mukherji Associates replaced halogen lamps with 32 LEDtronics GDL002-200-TPW-001M floodlights to illuminate landscaping along roadways, and 15 PAR38-7X3W-XIW-120AMD bulbs in uplight fixtures for tree and shrub lighting. “In addition to the energy savings, these lights will save annual relamping costs as the life of these lights is 50,000 hours,” says company principal Ram Mukherji. The project was financed by San Diego Gas and Electric at zero interest over about five years, payable through energy savings per month.